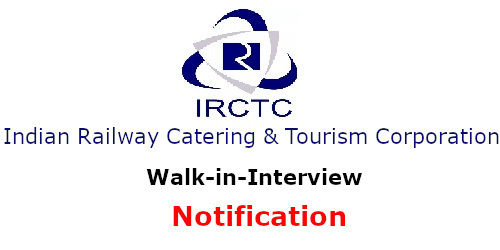 Eligible and Qualified candidates are invited to appear for a walk-in-interview for the post of Supervisor (Hospitality) on Contract basis for a period of 2 years and extendable by one more year based on requirement and satisfactory performance. 1. Essential Qualification& Experience: Full Time B. Sc. in Hospitality & Hotel Administration from Institution recognized by NCHMCT/Government of India/AICTE/ UGC. Experience: Minimum 2 years in F&B Industry (production /service/operations etc) of units having FSSAI certification, as on 01.03.2019. Teaching experience and training period (Induction) will not be counted as experience. 2. Consolidated Remuneration: Rs.25,000/-P.M. In addition, Daily Allowance Rs.250/- per day for on-duty on-board in train (s) Lodging Charges at outstation will be Rs.250/- if night stay is involved. The nature of duty would require movement in trains up to 22 days per month. 4. Place of Posting: The selected candidate may be posted in Tamil Nadu, Kerala and Karnataka states. 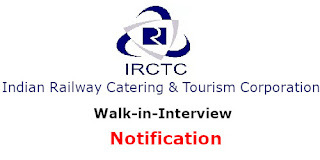 However, the candidate may be transferred/ posted anywhere India at discretion IRCTC. 2. An interview will be conducted, based on the credentials & performance in the personal interview the candidates will be selected and the offer of engagement shall be issued to the suitable candidates in the order of merit and based on a number of vacancies, subject to verification of antecedents. In addition to 74 selected candidates, names of 74 candidates will be placed on a reserved list for an unforeseen reason. 2. The contract may be terminated by giving one month notice by either side. If performance during the contract period is not found satisfactory the contract may be terminated with 15 days notice. 3. Medical insurance will be provided by the IRCTC to engaged candidates. 5. Those working in Govt. / PSUs may apply through proper channel/ submit NOC at the time of Interview or should submit a proper relieving letter from present employer in the event of selection in IRCTC. 6. IRCTC reserves the right to cancel/ amend the advertisement and/or the selection process thereunder. 8. Candidates should ensure that they fulfill the eligibility criteria prescribed for the post they have applied. In case it is found at any stage of the selection process or even after the engagement that the candidate has furnished false or incorrect information or suppressed any relevant information/ material facts or does not fulfill the criteria, his / her candidature/services will be summarily terminated. 9. The selected candidate(s) has to furnish a security deposit in the form of DD for Rs. 25,000/-. 10. No TA/DA will be paid to the candidates for attending the walk-in interview. 2. Address of Institue: INSTITUTE OF' HOTEL MANAGEMENT CATERING TECHNOLOGY AND APPLIED NUTRITION Near M.S.Building & SKSJTI Hostel, S.J.Polytechnic Campus, Bengaluru -560 001.